Use whatever pie dough recipe you like. 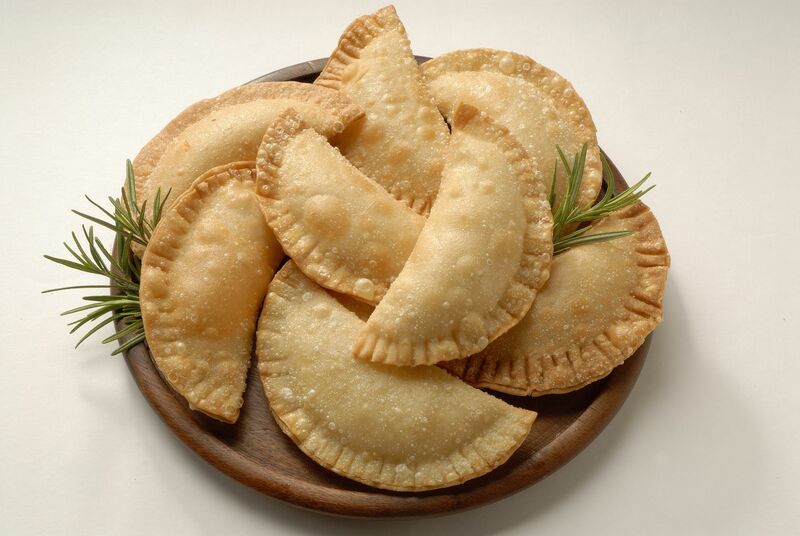 Note: Using a dumpling maker, or perogi press, makes filling the empanadas a snap. Yield: Depends on size. One recipe of pie dough made 2 large, 2 medium, and 1 small. Preheat oven to 375°. Pulse 2 slices of each of the meats and 2T of olive salad in a food processor until finely chopped, but not a paste. Working on a lightly floured surface, roll pie dough out to less than ¼″ thickness, and cut out rounds for filling reusing the dough scraps no more than twice. Note: The general rule of thumb for filling using a dumpling maker is: Small-1t, Medium-2t, and Large-3t. Do not over fill or the dough will tear. Place the dough round in the dumpling maker, fill with the proper amount of filling, add a small amount of the two cheeses, brush the edges with cold water and press to close and fill. Place the empanadas on a lightly greased sheet pan or cookie sheet. Brush each empanada with the egg mixture. Bake for 20-22 minutes until golden brown. Allow to cool for 10-15 minutes…yeah like that’s going to happen.